Fr. Atty concludes his three-part lecture, talking about the Good and Faithful Parish. Fr. 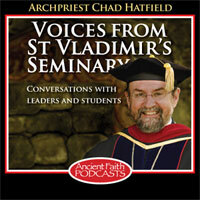 Alexander Atty continues his three-part lecture at the 2009 Lenten Retreat at St. Vladimir's. Today he addresses the Good and Faithful Parishioner. Stewardship Calling: Losing Our Christian Youth? Fr. Ted explains what baptism is, its purpose, and what it means for us as Orthodox Christians. Fr. Alexander Atty: Let me wrap up some of this, about being a good parish. That’s because we’re running out of time, right, Fr. Chad? Fr. Alexander: You didn’t know he was a ventriloquist! These are part of the workshops I do for our Diocese on church growth and parish councils. We adopted a very aggressive policy on anyone who wanted to be a parish council member, that they had to attend one of our seminars and be certified. Dirty word! And we thought—and my logic was this; this is what my dissertation was on for my doctorate, was on parish management—because I think when you have the true Faith, as we do, the Pearl of Great Price, why do we have substandards for parish administration? Why do we have people who don’t even practice or believe be on our parish councils? Just because they have money. That is the wrong way to go about educating our future and preserving our Church. So part of this program, and this is what makes a good parish, [is] we have a parish growth and then a requirement for parish council. So I might spin through some of this with you, and then at the end you can ask questions. Why make a parish grow? You need the money? Make our census look good? I know you’re laughing, but this is all true. To keep up with the Joneses? Or the Azars or the Kapsilakises or the Vladimir Putins. Why make a parish grow? You make a parish grow because—and this is an elementary question, but do you know most of our people don’t know the answer to this?—because it’s the Gospel. What makes a parish grow? Beautiful church? It helps. It should be beautiful. It should be our best effort. We get criticized for our magnificent temples, but it’s the only thing we can really offer to God that’s pure, and our church should speak to us. When we walk into a church, it should change us. It shouldn’t look like this room, here. This could be a church. We could worship here, but it’s not going to convert us; it’s not going to change our hearts. Friendly people, absolutely. People who are an example of the Faith. Oh, come on; you’re a smart crowd. Outreach. What makes a parish grow? Faithfulness to the Gospel and liturgical life. Crunching the numbers—and this is really important. This is where I try to stress to people what’s really important. You see all those numbers there? Now, I know you can’t imagine what the heck do they mean, but I have an answer for every one of them. This is what God gives you and me. Every year we live, 8700-plus hours are ticked off the clock. 168 hours in a week. If you went to Sunday Liturgy 100% of the time, and the average Liturgy was an hour and a half, give or take 15 minutes—sometimes mine’s almost two—we have 78 hours per year which is less than one percent of the year that God gives us in studying him. Less than one percent. You want to know how we’re not making an example of any of us, or we’re not converting the world? Because if we were just faithful 100% of the time on Sunday, we would only be there less than one percent, and all that pollution-free advice and teaching is in that, the Sunday Liturgy. Here’s another disastrous number. If our kids came to Sunday School the regular school year—I’m assured that you have Sunday School—and if they came 100% of the time and our parents don’t care if they’re late, our parents don’t care if they leave early, they’re going to have 45 hours a year in instruction. Who could possibly learn from 45 hours per year of instruction? What are we imparting to them? Nothing. Nothing, unless the home is on board with this! That’s why the Greeks have a great saying, and I don’t know it in Greek, but I admire what it says in English, that the home is a little church. It’s like a ribbon goes from the big church to the home, because they made their home part of the church: praying at home, reading Scripture at home, teaching our kids about the Fast, teaching about relationships. 45 hours a year doesn’t do nothing. We invest more into our kids into playing sports. 40 hours an average workweek; if you’re a corporate person, 52 hours. I watch college and pro football. I sin every Saturday and Sunday in the fall till the Super Bowl, and I think of all the hours I spend watching high-def, surround-sound football games. That’s hours lost, soaking in what the Church teaches. And I’m using myself as a poor example, so don’t follow me. Throw away your TVs and open the Bible and open some books on your faith. How do we change as people? Change begins within us. Mother Theresa says… You know, the press, they like to find fault with everybody, including her. They went to India and said, “Mother Theresa, how did you do this? Did you have a lot of benefactors?” She said, “I do this one person at a time.” So how do we change? How do we change our parishes? One person at a time. And it has to be… The cornerstone here is Christ and his Church. The cornerstone, the keystone. Church growth through spiritual renewal. The church has to be used. Worship besides Sunday. You know what Fr. Schmemann said one time? Of course, you know I love the guy. He said, “It will be a great day in the United States of American Orthodox churches when the lights are on more in the church than they are in the social hall.” We made a mistake somewhere. We can correct that. Tithing. You know why tithing is important? It’s not—let’s not look at the monetary harvest you get when you tithe. Tithing treats everybody equally. If you make ten bucks a week or a thousand, the percentage is the same. The playing field is level. No one’s in a higher class than the other. We cannot have a class system in the Church. The wealthy are the same as anybody else, and the poor are the same as anybody else. And by the way, when I say lost and fruitless energy on fundraising, that’s exactly what it is. People spend more time going to work in the kitchen, working in the kitchen, than they do go to church. I told you earlier that my parish had bingo every week. They had fried chicken dinners every week. So they had two days to set up, work the third day, and then clean up the fourth day. Would they go to church four times a week? No. They proved it to me: No. And fundraising, what did it do? It made them lazy. They want fundraising. Why? So they don’t have to give. Am I a little frank for y’all? Parish management, parish council. History of parish councils. Parish councils only in America. Origin: approximately 1917. Prior to that, the administration of a church was strictly from the ordained. People were selected, not elected, to specific duties, based on their talents, basically. Church was conciliar. Theocracy, not democracy. Let me talk to you a little bit about the origin, what approximately happened in 1917. You know, God bless the United States of America, but when our people came to this country, they established fraternal organizations. You know, you had AHEPA, you had Russian Brotherhood, you had Syrian and Lebanese clubs. It was a way of the people coming here sticking together. I find no fault with that, but when they organized a club in the United States of America, you had to file with a charter. And our country dictates, at least every state does, that you have to have by-laws and a constitution. So that’s what happened. And the next thing you know, that fraternal organization decided to become a parish. They sent a priest, they had religious services, they had sacraments—all under an American model of a corporation. And the earlier corporations were all lay people. There are parishes in the United States of America that are still not in a diocesan name. They’re under a Russian brotherhood name or something. So 1917 was the government’s interjection in how we run a church. The Roman Catholics somehow avoided that; we didn’t, because in our churches in this country, we, the Church, was not the missionary effort here. It was the people who, when they came here, wanted their faith, and they had to follow state law. In the state of Kentucky, we’re incorporated as a church under the state of Kentucky’s legislation. So that’s how it started. And what happened was, that developed into trusteeism and congregationalism, and then when the priest did come, he wasn’t part of the early administration, because the government said, “You have a president, vice-president, secretary, and treasurer.” There was no room for the pastor. That’s been changed a lot. Proper order of the Church: we’re a hierarchical Church. We have [an] apostolic order. St. Ignatius of Antioch was really the author of ecclesiology. He’s the one who sort of said how the Church should be run in its early goings. The ecumenical councils, they lay out the law; they laid out the order and law of our faith. Corporate order: if you want to think like an American in corporate America, you have your CEO, you have your president, you have your vice-president—well, this is the same thing: bishop to priest, priest to parish council and laity. And notice that the arrows go both ways. We don’t lord the administration over parishioners. We do have dialogue, but our dialogue can end very quickly once it violates canon law, because we’re to uphold canon law: you and I.
Here’s what most people think that the parish council, their role is: to employ the priest (I ended that quickly when I told them to fire me. They couldn’t. And also, I told them to give me a raise, and they didn’t—just kidding. I told you earlier I’d never ask for a raise; I still haven’t); manage the finances; set policy; control the laity, believe it or not. Here’s the true role of the parish council: assist the priest. You know, I don’t want to run everything. Sorry to tell people that. I don’t have enough time in the day to be the total administrator and do-all of St. Michael’s Church. And sometimes I feel like I am, but I need people to help me. I need someone who can take our finances and be transparent with them and do the books correctly and be there when we need something. I need someone to take care of buildings and grounds, someone to teach my church school, someone to direct the choir. That’s the true role right there: stewards of God’s property. We think we know… We have a terrible understanding of being a good parish. Stewards mean that it’s God’s church. No matter how much money we put into a church, it’s his church, and we’re the caretaker. We’re the caretaker; we’re not the owner, because when we get that ownership attitude, then not all people are equal. Provide for programs essential to the real business of the church. Too many people say, “Well, I’m working for the church, Father.” There’s a difference between “working for the church” and “doing the Church’s work.” Someone who’s rolling cabbage during vespers is not working for the Church. When there’s service… One of my biggest rules there was: if there’s a church service going on, nothing else goes on. You had people want to set up the hall, people want to cook, people want to get ready for someone’s marriage. No. Go to church. You’ll find time. It’s called priority. Are you qualified to serve the Church? Are you an example of the Orthodox life? This is really touchy, because I know people in my church that are good people, but they wouldn’t understand that their kid can’t get married during the Great Fast. And then they say, “Oh, Johnny wants to get married on March 17 because it’s St. Patrick’s Day, and she wants to wear a green wedding dress,” or something like that. And you say, “Well, no, that’s the Great Fast.” “Oh, I’m angry now!” Because we put people in positions that they don’t even know their own faith. It changed. It changes people, and not like you want to throw people out, but you want, you have to sort of guide them, like a funnel. A funnel guides something specifically, in a specific area. You’re to guide your flock that way. You take the masses, but you have to sort of tighten the belt, get them down that chute. Not only is it good that you be an example of the Orthodox Church, but you know the Church teachings and practice. I’m not saying that everybody on the parish council should be a monk or a priest or a deacon, but you should have some kind of knowledge. I have eighth graders that know more about the Church than their parents, and that’s not funny. That is not funny. Exemplary attendance at Liturgies, vespers, and holy days. When I first sent out a letter about the qualifications for parish council in my church, I got a call from Englewood—I’m sorry: I had two calls in 30 years—because I put in my letter that nine out of ten Sundays must be attended or you’re not eligible. And then I also put there: if you miss Pascha and Christmas, you’re not eligible. And I was told that I would never find 12 people to run for parish council with those rules. You know what? That was 30 years ago, and I have never been short of people who want to serve. Now I make them come the holy days, vespers. I don’t even make them. Those are the people we chose: the ones that are there for everything. And we choose them: it’s like they’re on the ballot, but they’re chosen. Steward of the church. You can’t tell people to give money when you don’t. Possess the vision of Orthodoxy outside of the parish. Meaning, we have to open our doors to other people, because our kids are going to marry other people. Out of 30 years of marriages at St. Michael’s, I’ve probably married 250 people. I’m saying eight a year, let’s say. I can count on both hands those people who married Orthodox. Ten out of 250. And not Lebanese to Lebanese, either: Greeks to Russians or Lebanese to Russians, Lebanese to Greeks, Romanians to this. Ten just total Orthodox. That’s it. So 240 did not marry Orthodox to Orthodox. So the first thing in my head was, as an engineer, when I first moved there I saw the demographics that they weren’t marrying people in their church: it was time to really, really make the church a warm, spiritual place that that other spouse joined, because when an Orthodox marries a non-Orthodox, ultimately you lose both of them and their kids, and that begins the slippery slope down to an empty church. Church mission. Here is the main thing of a faithful and good parish. All these are the necessary elements of what makes our church a real doer of the Gospel: because it takes care of everybody. We have to think from our youth, our elderly, the poor, homeless, shut-ins, hospital and nursing home, but to be a witness. Education. Retreats. Thank you for coming, by the way, today. This is a retreat for you. I want to tell you a little story about the homeless. I go to a gym every day, and I met a lawyer there that’s really a decent guy. He’s the Roman Catholic Archdiocese of Louisville’s lawyer, and he lives in my neighborhood. Humble. I don’t live in a rich neighborhood, so I’m telling you he’s humble. He has a lot of kids; he’s a good Catholic. And every year, he dresses up as a homeless person and attends Mass at a Catholic church. And then he comes back the next Sunday and gives a report on his reception in that community. So I’m thinking one day, [when] I’m listening to him; I’m in the gym, and I said to him, “Harry? Would you come to my church? I won’t let you give a report. No one speaks from the pulpit in my church but any of those who are ordained and qualified.” “Sure.” I was a little hesitant. You want to know the truth? I didn’t want to know the grade, because I sometimes don’t think our people have any love for other people, especially the poor and the homeless, like they chose to be homeless. They chose that; did you know that? So Harry dressed up as a homeless person, came into our church, and sat down. We had the highest score out of all the parishes he visited. I was holding my breath. I only told the parish council chairman that he was coming, so he kept an eye on him just in case somebody hassled him. I worried about that. But he told me, at one Catholic church that he went to, when he sat down, this woman pulled out her cell phone and called 9-1-1. During the Mass. Must’ve been the offering. She was avoiding the offering. But she called the cops. So when you talk about being a good parish, we can build the most beautiful temples, have the greatest social halls, wonderful food, but if we don’t give our people the living waters, we’ll be a whited sepulcher, a pretty mausoleum with nothing but bones inside. Our mission, vision, and purpose, spiritual life, liturgical life, education, community—meaning just not our community, but the community that exists outside the walls of our parishes—stewardship, outreach, governance. Our parish has to be governed with transparency. Our records are open to anybody. You want to see our bills? You want to see our checking account? You want to see our savings account? They’re published, as they should be. Maybe they’ll realize that we’re poor. We’re not poor. Spiritual life is the heart of our community. What we do in church should do everything for us. Holiness, not happiness. That’s our role: to be holy, to acquire the Holy Spirit. Our spiritual life is the main reason for existence as a parish. Liturgical: feed the sheep. Celebrate, worship, and sacraments with care and beauty. I have to tell you, since I’m an honest kind of guy: I’m disgusted when the church services are cut short, they’re not done properly, our choirs don’t practice enough, our people are sloppy at entry and exit. When we approach the church with that kind of level, what do you expect? What do we expect that our kids are going to do? Promote active participation in all aspects and at all levels. Involve the people. Education. Religious education [for] the whole community. I told you earlier, we end up at schools being terminated at senior. They graduate from high school, they’re out of there. Our education has to be total-parish, and constantly, constantly. Provide retreats and seminars throughout the year. Our parish has four retreats and seminars a year, at a cost of $20,000, because we pay for the food; we pay for the speakers, because we don’t want money to be the barrier there. We don’t want someone to say that the church has its hand out. We want them to come and be educated. It’s the deepest root we can have, right there. Community life. Provide facilities and grounds conducive to worship, fellowship, and meeting. Good communications. Health fairs. Youth and seniors ministry. Participate in local, national, and global events. Our stewardship. Identify and utilize parishioners’ skills and talents. Teach and encourage tithing as the real commitment to Christ. Promote only fundraising that is not in conflict with the Gospel or Church life. What is that conflict? Well, any form of gambling, to me, is in conflict. Any form of fundraising that takes you out of church. Any form of fundraising that serves food that’s not permitted to be eaten at that time. Fundraising. I wouldn’t have belly dancers in my church as fundraisers. Promote parish growth through education and service outside of the parish. We have a festival every year at St. Michael’s called “The Taste of St. Michael.” It’s really… It’s sort of modeled after Ed Day here [Orthodox Education Day at St. Vladimir’s Seminary], because I went here. I had some influence of Ed Day. Ed Day had liturgical life, lectures, books to sell, recordings. We have church tours. We have speakers. We do sell our food there, too, because it’s sort of—I hate to tell you—it brings people. But once they’re in there, then we have to get them. Promote inter-Orthodox relations. I think we’ve failed miserably in our camaraderie with all of our Orthodox brethren. We need to do some work. I know bookies. I grew up in Pennsylvania where every Lebanese guy had a cigar-and-magazine store that was [as] big as two phone booths, and they were rich. And then they would show you the back door, and they would have chalkboards, and they would have… They would be bookies. Well, now, would I have him on my parish council? No! Is he a bad guy? No! He needs a little ... injection of spirituality, but this is why it’s not about secular knowledge and material success that we need people like that on our parish councils. Fr. Chad Hatfield: I think that the Special Events Committee chose well in what we were looking for. Fr. Alexander, you’ve presented us something today that probably many would consider quite radical, but what you’ve actually done for us is you’ve just given us what I think we Christians should call the Gospel truth. There’s nothing radical about it. It’s just who and what we are. So thank you for reminding us. You have fed us. We can all go home with much to contemplate and much to act upon. So thank you all for making the effort to be here, and on behalf of the seminary, we wish you a Great and Holy Pascha. Fr. Alexander: Thank you very much.